PE0250. 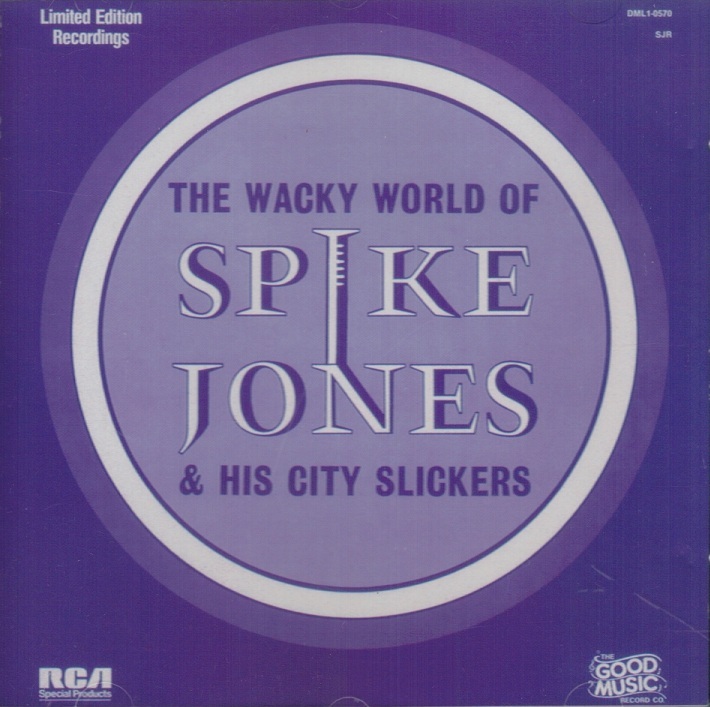 Spike Jones & His City Slickers: 18 hilarious renditions. RCA DMC1 0570/SJK, transfers from Jones' legendary 78s, incl. the inevitable ‘Der Fuehrer's Face’, itself worth the price of the CD! Final Copy! “Lindley Armstrong Jones was a musical genius. 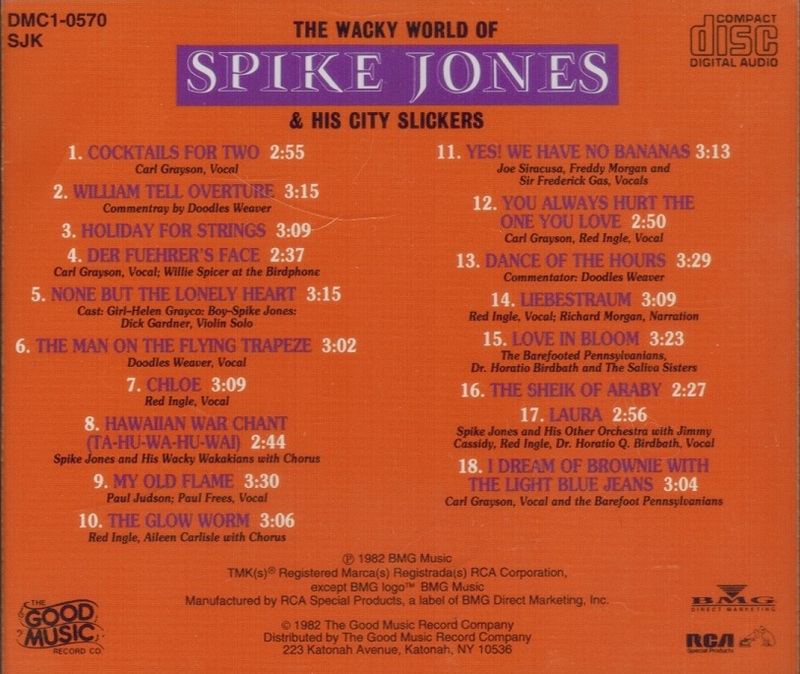 In the wild and woolly days before multi-track recording, MTV, and certainly digital entertainment content, Spike Jones put together a top-flight musical organization of which the world has not seen the likes since. Known as the City Slickers, the emphasis was on comedy, primarily doing dead-on satires of popular songs on the hit parade and taking the air out of pompous classical selections as well. Not merely content to do cornball renderings of standard material or trite novelty tunes for comedic effect, Jones' musical vision encompassed whistles, bells, gargling, broken glass, and gunshots perfectly timed and wedded to the most musical and unmusical of source points. His stage show was no less mind-boggling, needing a full railroad car just to carry the props alone, all presented without electronic gimmickry of any kind, with visuals that would make your eyes pop out of your head. 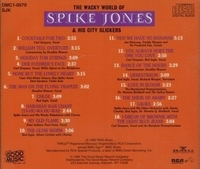 Though he often downplayed his musical achievements (all part of the master plan of selling the idea to the general public), the fact remains that Spike was a strict bandleader and taskmaster, making sure his musicians were precision tight and adept in a variety of musical styles from Dixieland to classical, with a caliber of musicianship several notches higher than most big bands of the day that played so-called ‘straight’ music. In other words, Jones was no dummy. He knew what he was doing when he put the whole concept together - checkerboard suits and all. It gave him Top Ten hits on phonograph records and proved immensely popular as a stage show, in movies, and on television. (It became a badge of honor with pop musicians that you really hadn't tasted true success until Spike Jones & The City Slickers had destroyed your song.) A definite precursor to the video age, Jones didn't merely play the songs funny, he illustrated them as well, a total audio and visual assault for the senses. Jones (the son of a railroad man, hence the nickname) had started as a jazz drummer and radio session player working with top-drawer stars like Fred Astaire and Bing Crosby, among others. But as in-demand as he might have been, musician union restrictions only allowed so many radio dates to be worked by one drummer. To this end (and to distinguish himself from the pack), Jones added a full set of tuned cowbells, guns, whistles, and sirens to his already existing drum set, thus insuring steady work as a both a drummer and small-scale sound effects man. Although these additions made him unique in a field loaded with anonymous sidemen, Jones had bigger and crazier ideas [and]he formed the City Slickers in the early '40s. In 1942, a strike by the American Federation of Musicians prevented Jones from making commercial recordings for over two years. He could, however, make records for radio broadcasts, thus ‘Der Fuehrer's Face’, became not only a national hit but a national mania, and Jones' self-named ‘musical depreciation revue’ was off and running. The bands assembled over the years under the City Slickers banner would feature everyone from singers, midgets, acrobats, and vaudeville comics to musicians who could just plain blow their brains out, all hand-picked by Jones. From George Rock's braying, high-register trumpet and kiddie voices to Freddie Morgan's incredible rubber-faced pantomime banjo shenanigans, from Sir Frederick Gas' insane ‘twig’ bowing to Billy Barty's Liberace impressions, here was a band that truly defied description. Musicians who could play multiple instruments in a wide variety of styles were commonplace, making the City Slickers the crackerjack unit they were. But certain members of the troupe (like Gas or Barty) were hired because they did one thing extremely well, and would proceed to do it on a nightly basis, key players all.